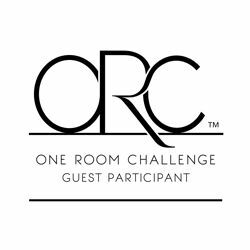 It is Week Four of the One Room Challenge hosted by Linda @ Calling it Home. We are so busy trying to transform our old builder-grade-wire-shelved pantry into something both beautiful and functional for our family. I am dreaming of a pantry like this inspiration from onekinddesign.com. Drawers on the bottom with nice shelves on the top is what I am hoping to achieve. The first thing we did this week was continue building the shelves. The actual shelves were cut from MDF and painted white. Then we used a simple trim piece to finish the front edge. Holes still need to be filled before a final coat of paint will be put on the shelves. Fitzy’s parents came to visit for the weekend from out of town. 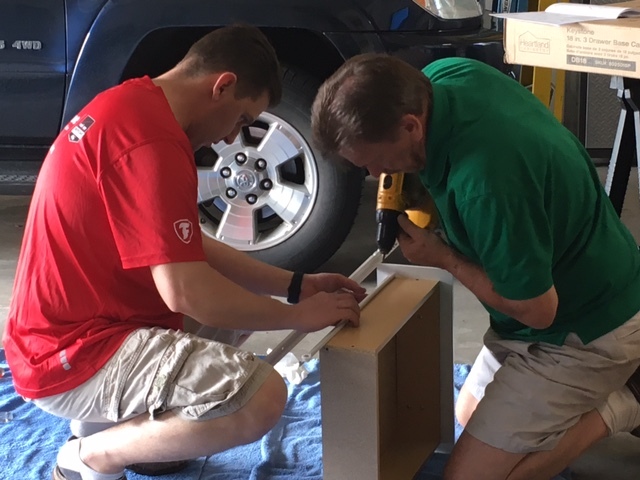 This was a great opportunity for a little father / son bonding while building the base cabinets for the pantry. Thanks Dad!!! 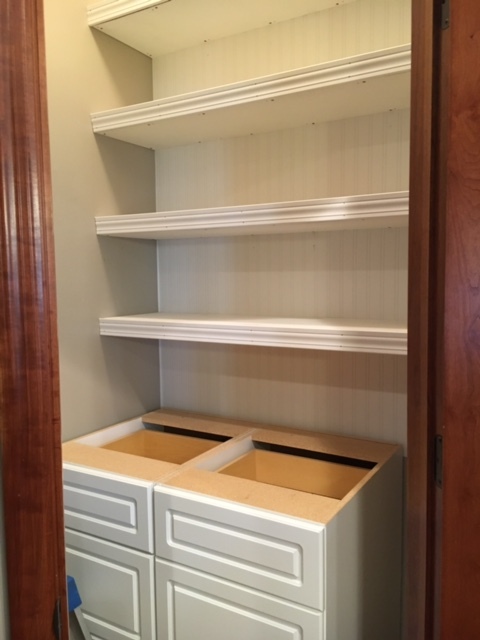 We ordered basic stock cabinets from Home Depot thanks to the recommendation from Danielle at South of Peachtree. 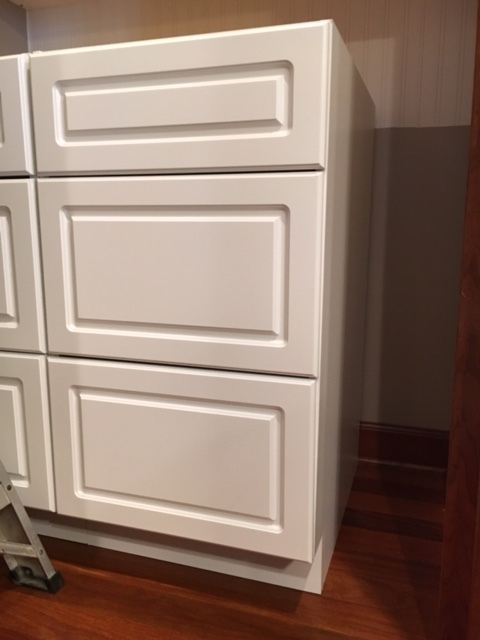 Check out her Fall One Room Challenge to see another example of the base cabinets from Home Depot. 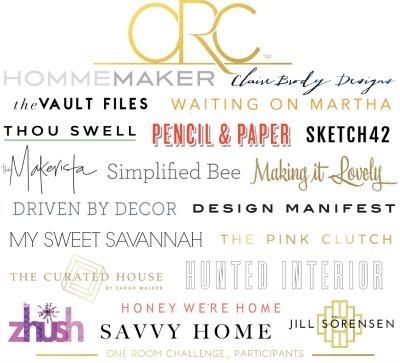 We made some serious progress on our One Room Challenge this week. Up next: fill holes, final coat of paint on shelves, install hardware, and build the counter top. Gosh…I am so excited to see this space finally start to come to life!!! Great progress this week! The pantry is really coming together! I love your inspiration photo. I am lucky enough to have a large pantry, but it sure doesn't look organized like that one. It became a catch it all when we moved into our house. I should probably pull everything out and do a big organization. Pinning your photos. Thank you for your encouraging words. It might seem a little silly but the project feels like a game changer. The kitchen is the heart of our home and this organized pantry is really going to help with meal prep and school lunches. It is looking great! Thanks for the link and I'm so glad the information helped! You will have so much fun putting it all back together once the building is done! Thank you Danielle! Your recommendation was so helpful. We were able to get the cabinets ordered and delivered in no time. They were relatively easy to put together and truly saved us a tone of time (and headache)! Isn't that the truth. My husband is Fitzy. The whole reason my blog is titled Hey Fitzy is because I am constantly saying, "Hey...Fitzy...I have an idea/project". This normally means I have come up with come crazy idea and he will need to help me. :) Thankfully he enjoys any opportunity to dust off the power tools. Great progress! I love your inspiration image. I wish I had a pantry like that. Can't wait to see your final reveal! Thank you Sabrina!!! Love your nursery BTW!!! The progress looks so great! Makes us dream of having a pantry this size, but you've got to work with what you have! We'll be checking back in for the reveal. Best of luck! You are making great progress! I can't wait to see the end result! It will be gorgeous! 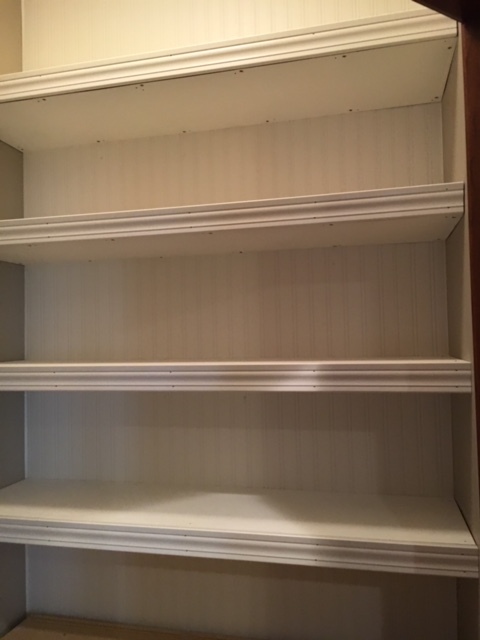 Hi Judith, It is amazing what a little trim work can do to dress up the shelves. We ordered the stock cabinets from Home Depot and they were delivered directly to our door. We had to put each unit together. Directions were easy to follow and really didn't take too long...maybe one hour per unit. Oh Tammy I am so excited to the reveal. I am a bit late to the TOHOT party as I was finishing my college semester finals but I'm so glad to be here now. Truly fantastic! Have a wonderful week. Thank you Laura! Good luck on your finals!!! 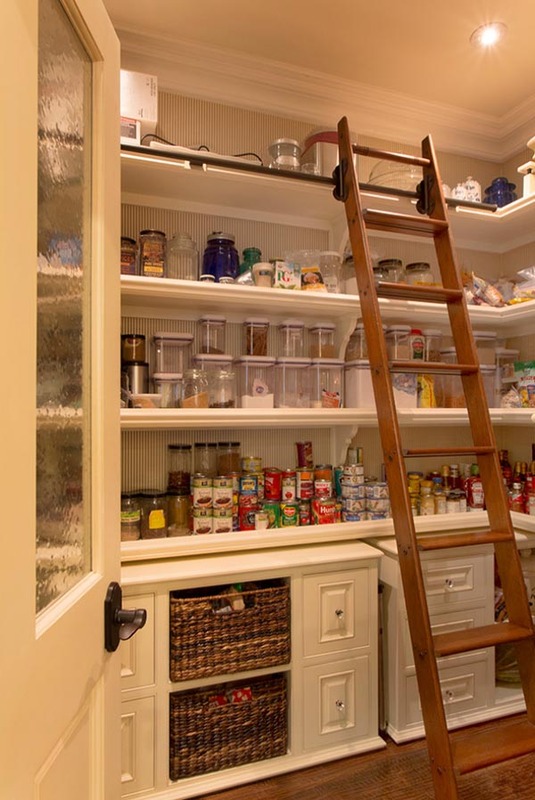 I am so jealous of this pantry, I wish we had room for one in my house! It's going to look great!